DO YOU HAVE MOVIE DREAMS OR RADIO DREAMS? If dreami11g for you is like listening to a radio, you are a lexicoder. Many authors, for example, who obviously are more verbal than mosc people, will have conversations in their head with their characters or imagine conversations their characters have with each other. If you are a lexicoder, you might find yourself saying things repeatedly to formulate your thoughts. You probably enjoy lecture-based learning and moving words around and around to develop ideas. You fed words are your friends, bur you may have trouble trying to visualize scenarios. If your dreaming experiences are like watching movies, on the other hand, you are an opticoder, and you most likely can take a mental image and make it sit, stand and rotate in your mind. You probably find yourself frequently wishing people would get to the point, rather than talk so much. You see the “big picture” rather easily and think in logical patterns. We have five senses, including the two primary senses of seeing and hearing and the three auxiliary senses of touch, taste and smell. Our primary senses are used to form thoughts by moving stimuli from the sense organs of eyes and ears through the brain processes of attention and memory, to become knowledge. The eye-to-brain pathway is called the opticoder (the visual brain), and the ear-to-brain pathway is called the lexicoder (the auditory­verbal brain). If the opricoder is overworking, which means the visual brain is dominating, it can become the enemy of the lexicoder and cause a lack of sensory integration between the two primary systems. In other words, the dominating visual brain interferes with the activity and development of the auditory-verbal brain. Approximately 32% of the population is born with a visual brain. This means thar these people use their opticoder to think and process information, just as a small percentage of the population prefers to use their left hand. At birth, these babies decode the world around them through visual analogies rather than verbal reasoning. They score knowledge in mental slide trays and movie reels. Often speech, reading, spelling and writing can seem cumbersome and slow. Careers such as surgery, electrical engineering, computer science and graphic arts depend heavily on the opticoder. However, without word-based knowledge, none of these skills can be acquired, nor can they advance to the next level. Visual images are great for receiving knowledge, but they are far less adequate for expressing knowledge and communicating. A surgeon must still talk to patients, write chart notes, read medical journals, attend committee meetings and exchange information with colleagues. There is no escaping the lexicoder’s importance in daily life. Although lexicoder communication skills are what distinguish humans from all other species, the opticoders throughout history tend to leave the most lasting legacies, the Einsteins, da Vincis and Edisons of the world. 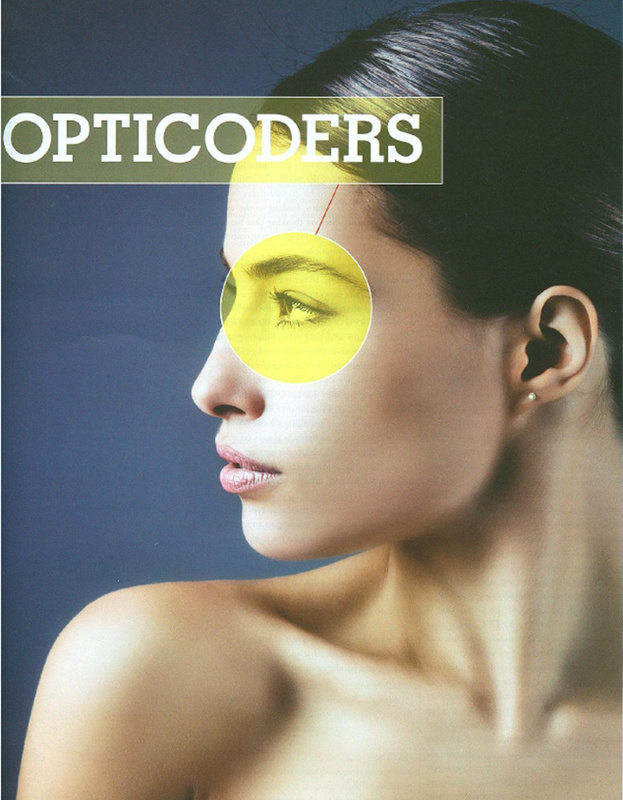 The opticoder brain is considered to be 20,000 times faster than the lexicoder brain, leading to the type of visual, outside-the-box thinking that has resulted in some of the world’s greatest inventions and creative contributions. 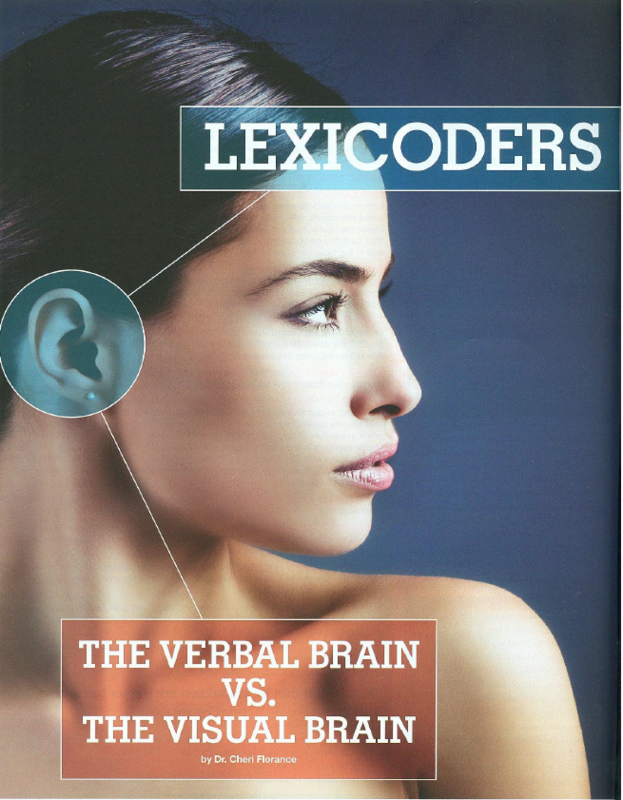 But the lexicoder is needed for learning, loving and achieving. To get thoughts into and out of the brain, people use words. Verbal communication accounts for 76% of learning in the classroom, 85% of career activity, 90% of love affair intimacy and long-term bonding, and 95% of parent-child shepherding and guidance. Most humans rely on the lexicoder 24 hours a day, seven days a week. We cannot shut our ears like we can shut our eyes. We awaken to an alarm clock, pull the car over when we hear a siren, and answer a ringing phone-which means our hearing vigilance is always on duty. So in addition to the lexicoder serving as the genetic basis for communication, learning and relating, we practice using the lexicoder nearly all the rime. Furthermore, our educational system devotes the majority of its time training us to improve spelling, writing, speaking in front of a group and comprehending reading passages, all of which require us to practice using our lexicoders in a step-by-step, sequential building pattern to improve efficiency. The first grader reads and listens to much less sophisticated language than the ninth grader; a college freshman class is much less demanding in terms of language pro­cessing than a medical-school lecture. We are training and building our lexicoder throughout our lives. There are many children who are in the 99th percentile for their visual/associational chinking, but in the zero percentile for their verbal/se­quential skills. l coin the term “Maverick Mind” to describe chem. These are not autistic children, not children in the middle of the bell curve, but outliers with a genius in one area. These children think a thousand times faster than their mouths can go. They communicate at such a high level through a world of mental pictures and videos that their verbal communication suffers. They may even enhance their visual ability by trying harder and harder to communicate in the only way they know how, causing an ever larger gap between their visual and verbal communication skills. Mavericks can appear as if they are “strangers in a strange land,” unable to understand, think or speak in a language familiar to verbal people. Their brains literally speed past language in such a way that language does not properly develop. In such a situation, the symptoms that result often mimic the symptoms found in autism and other disorders of language and communication. With Mavericks, however, I believe we can train the brain to switch channels between the opticoder and lexicoder brain. Many people are diagnosed with attention deficit disorder (ADD) because they cannot maintain an adequate attention level for language-based tasks. In extreme cases, they have been diagnosed with autism, as the attention to verbal tasks seems nonexistent. Meanwhile, Mavericks may focus intensely on visual tasks to the point where they do not hear anything that is said to them and become very frustrated when interrupted. The first step in assessing any potential Maverick is to gather information on the subject’s history. What are his or her behaviors, abilities, difficulties, challenges? What are some notable events or incidents in their history? The best answers come from the parents, who tend to know their children best. Parents naturally monitor a child’s strengths and weaknesses with a mixture of hope, joy and fear, so they tend to recall specific incidents that gave them a sense of joy, pride or concern. Visual Attention. By addressing three sets of visual skills, the Maverick learns to control the way his or her brain works in the visual medium they know so well. This control can then be transferred to the auditory processing char they struggle with, allowing them to improve in that area. Auditory Attention. Auditory attention begins the process of forming auditory sequential thought, which is the foundation necessary to listen, read, write and speak. The auditory attention is weak, it becomes difficult, if not impossible, to learn in a classroom, hold a conversation, manage time or organize and sequence tasks. Visual Memory. Visual memory is the ability to process and store images and their associated attributes. The visual associator works optimally when it can complement the auditory sequenc­er, but for Mavericks the associator can become the enemy of the sequencer. The associator can multi-task, managing an enormous workload effortlessly, while the sequencer must process information sequentially. Auditory Memory. 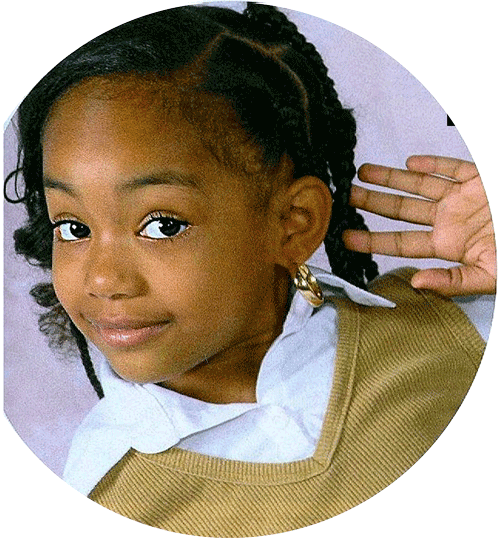 Auditory memory is the ability to process sounds and phonemes (sound units that make up words). Auditory sequential memory is the driver of all language processing, including listening, reading, speaking and writing. Your auditory memory creates sound language connections, processing sounds into information and storing the information as knowledge for later retrieval. STEP 2 involves anchoring the “Central Executive” to gain self-control. The Central Executive is what controls mood, behavior and communication, and allows “channel switching” between the visual and verbal brain. The Central Executive prioritizes, plans and forecasts thoughts into words. It anchors the brain for using language to express thoughts. beings move knowledge into the brain. By anchoring the Central Executive, Mavericks are able to use their brain support to control how they manage information. Fluency in thinking and communicating comes from the efficiency in which new ideas move from immediate recall co shore-term memory co long-term memory. Once the Maverick’s world of pictures opens up to include a world of words, they begin absorbing, distinguishing and processing sounds chat the rest of us have grown up with all our lives. Listening and reading skills allow more knowledge to move into the brain. With more knowledge comes greater understanding and a greater ability to communicate. Basic vocabulary-building grows to include deeper thoughts and concepts for better interaction with the world around them. STEP 4 focuses on developing output processors, or learning the expressive language skills of speaking and writing. All of our lives we rely on our receptive language to help us express our ideas from thought to word. Our skill with speaking and writing is how we are measured at school and work. We learn through our receptive language, but we are graded by our expressive language. And learning how to efficiently use language is what makes us human beings. STEP 5 focuses on transferring the newly ac­quired skills and building self-esteem for meeting the ultimate goals: successful interaction at home, school and work. Generalization occurs when the skill becomes a fully functioning automatic habit that no longer relies on support. Once a Maverick is generalized at home, school and work, they are considered to be mainstreamed. Brain World is published by the International Brain Education Association (IBREA), a nonprofit organization associated with the United Nations Department of Public Information.